From one level of perfection to another, the White Japanese Akoya Pearl Necklace takes you on an amazing journey with just the click of the clasp. 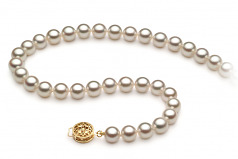 The most sophisticated and timeless white pearls, the 6.5-7mm size is perfect for your everyday wear options. Easily transitioned from formal to business and casual, they make using different aspects of your wardrobe easy, fun and exciting. Your fashion sense just opened up far beyond your wildest dreams with what you already own. Cultivated from the oyster, the Japanese Akoya is grown as the sole pearl in each oyster. 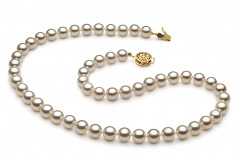 This allows for a greater degree of perfection and the more often than not complete excellence in each pearl. Grown for many years before coming to you, they will provide you will a lifetime of traditions and compliments.